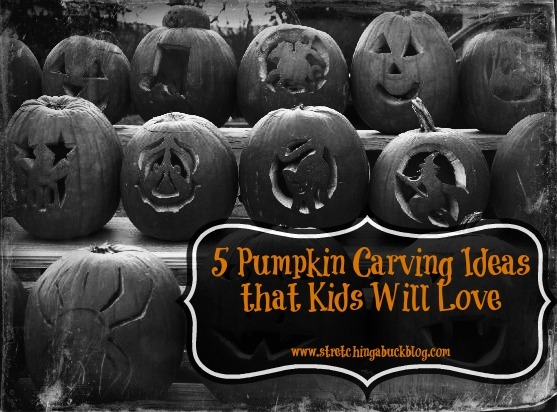 If carving is your thing, there are many different pumpkin carving ideas that the kids can help with. Just be sure to put safety first when it comes to knives and other cutting instruments! 1) Robot Pumpkin: This is easy and very kid-friendly because there are no curvy lines. You just cut squares for the eyes, nose and mouth. There are no teeth or eyebrows, unless you want them. If your kids are really little, pre-cut the squares and let the kids push them out so that they do not have to handle the knife. Once you cut the top off, the kids can scoop out the “guts” of the pumpkin for you and then you can roast the seeds for an extra treat. If you want to get fancy with your robot pumpkins, check out these robot pumpkin ideas on Pinterest. 2) Haunted House: This is a fun idea that can be as simple or as complicated as you want. You can go intricate with windows, doors and scary characters, or you can do a basic house shape. The design is completely up to you and the kids. 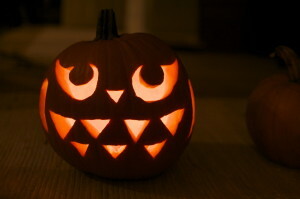 If you make the house big enough, you will not even need to cut off the top of the pumpkin to put a light inside. 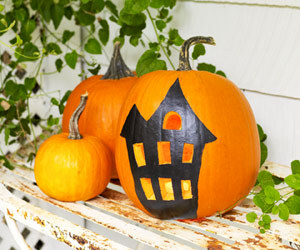 Personally, I like this painted haunted house pumpkin with the windows carved out. Google “haunted house pumpkin stencil” and print a stencil for free. 3) Owl: This is best for kids that are a bit older, but they do not have to be teens. You just need to cut out owl eyes and a body shape. If does not have to be perfect, of course. This one can also become quite the work of art if you have the time and ability. You can put the owl on a tree branch, carve out a surrounding tree and put a moon and clouds in the background. As you can see, this can be as simple or as intricate as you want. You can also choose between a scary owl and a cute owl. I like the owl seen in the picture below, but there are a lot of great Owl Pumpkin Ideas on Pinterest here. 4) Ghost: There is no right or wrong way to create a ghost. If you have more than one child, let them each carve their own ghost into the pumpkin. You can also add tombstones, a moon and some clouds to make it extra eerie. Then, just cut off the top and place a flashlight inside to bring the design to life. You can find 14 Easy Printable Pumpkin Carving Templates (including ghosts) here. 5) Witch: This can be just a witch’s hat or a full witch. It all depends on how much work you want to do. If you want a quick and simple carving, a hat only is the best way to go. To do a hat, carve a triangle out and then carve a disc-shape out right below it. This is an easy design that will look good even if it doesn’t come out perfectly. I also like the ideas seen here, where you turn the pumpkin so that the stem is the witch’s nose. Too cute! What are your favorite pumpkin carving tips and ideas? Find more Halloween tips, tricks and ideas on how to save money here.